Mike Thornewill, from Nottingham, works as a policeman. His interests include: Mountaineering, running and cycling. Mike has been a keen mountaineer for 25 years, having climbed extensively around the world. More recently, Mike took an interest cold climate travel, having dog sledged in Spitzbergen and walked to the South and North Poles. 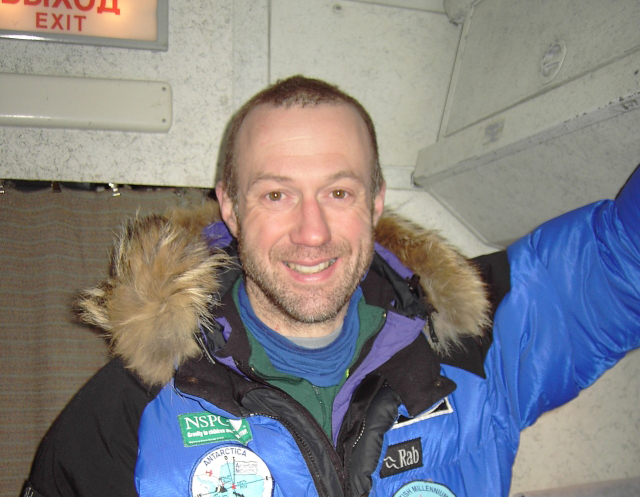 He has guided two novice expeditions, one to Finnmark in 2002 and another to make the first ever foot crossing of the Canadian Great Slave Lake in 2003. Reason for going south again: "Someone needs to tell my wife when to stop walking! - Really, I'm passionate about the untainted beauty, the challenge - and showing others how much there is to life." Mike Thornewill has been an active mountaineer for 20 years and is the holder of a gold Duke of Edinburgh Award. He is a competitive runner and cyclist having completed triathlons at the Ironman' distance. Over a curry one night, Fiona agreed to join Mike in his boyhood dream of crossing overland to the South Pole. Pushing themselves to the limits of endurance and their relationship! Despite a collapse of his knee Mike overcame terrible pain to reach his personal goal. 2000: 86th person (7th Britain) to ski to South Pole - without dogs/vehicles. 2001: 117th person (8th Britain) to ski to North Pole - without dogs/vehicles. 2001: 3rd Britain to ski to both Poles. 2001: 31st person to travel both Poles - surface travel using any means.